I had a chance to try out the SimCraft Racing simulator at CES, and I thought that it was a trip. However, just picture how cool it would have been if I had been sitting in a Formula 1 car! I mean, if you can’t afford to drive a real car on a track, then maybe you can have the car! Okay, I’ll admit that was pretty sarcastic, but at least the car has real tires, racing seat and harness, steering wheel, and pedal system. The car is mounted on a pneumatically powered motion platform that is similar to the ones used in Flight Simulator training. It has a nineteen inch monitor for viewing the road, which sort of pales in comparison with Simcraft’s wrap-around triple display. The F1Showcar Motion Simulator will set you back $44,900. Yeah, this definitely a toy for those who clearly have money to burn, which does not include myself. I also don’t have the space in my place for something like this, either. 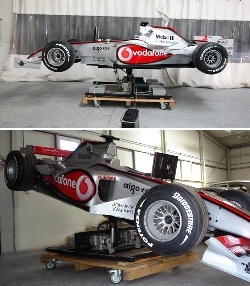 Then again, it doesn’t seem right to buy a Formula1 car and just mount it on a platform. Still, I think I can see why it was done. How else are you going to get the feeling of driving without using a real car? It reminds me of a video game in Japan called Initial D where the player was in an actual sports car to engage in The Fast and the Furious type races. I wrote about that here if you want more information.